Climate change is our planet’s greatest challenge, so it is no surprise that artists increasingly reflect environmental issues in their works. These works can enlighten viewers and instigate meaningful discussions about climate change. Most importantly, art serves as a universal language which can create change though the pure power of images. For example, “Waving Wall” by Bloo Nation ” is a “vast undulating wave” made up of 1,200 nineteen liter water bottles, which is equivalent to the amount of water needed to produce only two pairs of jeans. 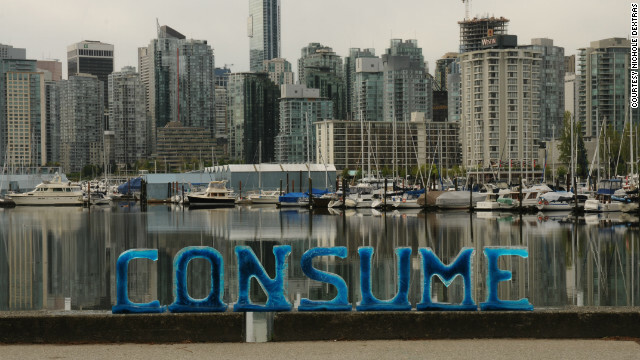 The piece, puts into perspective a basic consumer habit and examines modern issues surrounding climate change. Nature does not end in the city — it is all around us in the gritty wind, the flow of urban rivers, even in puddles. Art can make us aware of nature’s presence, but it can also show nature’s processes. I make art to show how nature works: The schedule of the tides, the currents of the rivers, the heating up of the atmosphere. And art can also do some work around the planet. The next big step for environmental art is to be part of the toolkit for solving simple environmental issues. I have made several works that allow rainwater to soak into the ground slowly as it should, not rush off to erode the embankments of streams. My works take what the site engineers consider a problem and make it into an asset. Read the full article by George Webster with more artists’ feelings and climate change art here. Once again this reaffirms what researchers discussed at the conference for the American Academy for the Advancement of Science. Building a sustainable future requires more than just science, and art is part of the solution.